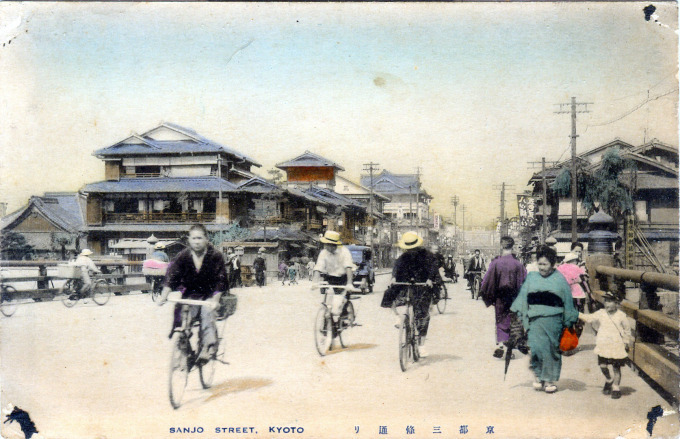 From the wiki: “Sanjo Street is located in the center of Kyoto and stretches from Shinomiya in Yamashina-ku to Togetsukyo Bridge in the Arashiyama area, and is one of the oldest shopping districts in Kyoto. The Sanjo Bridge was near where three incidents tied to the Restoration took place: the Ikedaya Incident; nearby the former hideout of Sakamoto Ryōma; and near where the assassinations of Ohmura Masujiro and Sakuma Shozan took place in separate incidents. “Under the new Meiji government, Ōmura Masujiro was appointed to the post of hyobu daiyu, which was equivalent to the role of Vice Minister of War in the newly created Army-Navy Ministry. In this role, Ōmura was tasked with the creation of a national army along Western lines. Ōmura argued that if ‘the government was determined to become militarily independent and powerful, it was necessary to abolish the fiefs and the feudal armies, to do away with the privileges of the samurai class, and to introduce universal military conscription.’ Ōmura’s ideal military consisted of an army patterned after that of the Napoleonic French armies and a navy that was patterned after the British Royal Navy. “Born in Matsushiro, the castle town of the Matsushiro domain, Shozan Sakuma studied Chinese learning under his father, a scholar-administrator of the domain and Satō Issai, a professor at the Shōheikō, a Confucian academy in Edo (present-day Tokyo). Just like many other intellectuals of his time, Shozan was alarmed by the rising power of Western nations as illustrated by China’s humiliation in the Opium War (1839-42). The impression that this event left in him was a lasting one: Western technology, he analyzed, was the cause of the defeat of the nation whose wisdom and culture he admired. Shozan became an advocate of building a powerful modern navy and of establishing a national school system to offer everyone an education based on the ethics of Confucianism. “As Shōzan immersed himself in the technical knowledge of the West during the 1840s, he conducted a series of experiments. Relying on the Dutch translation of a French encyclopedia by Noël Chomel, he produced glass in 1844. Following other Dutch books he later cast a Western-style bronze cannon and conducted experiments with electricity based on the elekiteru [electrostatic generator]. “In June 1864, Shozan was made an adviser to the shogunate on defense matters and went to Kyōto, then the hotbed of sonnō jōi (‘Revere the Emperor, Expel the Barbarians’) advocates. In sending Shōzan to Kyōto, the shogunate appears to have intended not only to have him serve as an adviser, but also to win the sonnō jōi faction over to the movement for union of court and shogunate. But, before he could exercise any influence on behalf of the shogunate, Shozan was assassinated by a sonnō jōi adherent, Kawakami Gensai, in Kyoto in August 1864.